Written, directed and performed by Glyka Stoiou, the Commedia dell’arte-influenced Don Quixotes (based on Don Quixote by Miguel de Cervantes) performs at Cyrano’s Theatre Company for one weekend only. 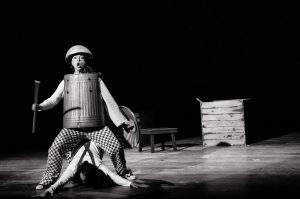 Visiting Stage Talk from her native Greece, Stoiou, along with cast mate and fellow Greek Angeliki Karakaxidou, talks about her play, her process and the absolute zaniness of the performance. Also joining Stoiou and Karakaxidou is Cyrano’s Producing Artistic Director Teresa K. Pond. Don Quixotes performs June 21-24. ORIGINAL BROADCAST: Friday, June 22 at 2:45 p.m.